This small but very handy tool allows you to find and remove duplicate music. This simple software will be particularly useful for music lovers, stored on your PC gigabytes of music. Certainly among this huge number of music files will be many of the same songs. Not only do they take up disk space, but also clog up your music collection, making it confusing. This program will help to get rid of duplicate music quickly and easily, while the search for duplicate songs by hand can take a whole day. The program has a very simple interface, so it can work with even non-specialists and even novice PC users. 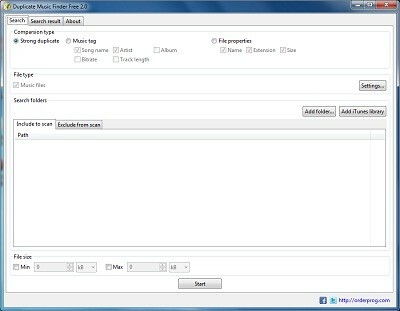 With this tool, you can search for audio file duplicates on music tags: song title, artist, album, and so on. You can also search duplicate music files with the same size or extension. The program is absolutely safe to use and do not remove without the user's command.